Cakes and pastries are two of our favourite snack items. We used to have them for snack and dessert almost every day at the height of the Cupcake Wars TV program. The cupcake wars may be over but my love for these baked products is as strong as ever. Mom and Tina’s, Frostings, Frosted, Cupcake Lab, and Sonia’s Cupcakes are some of the shops that we love to visit. A recent addition to this list is the Capriserrie Bakeshop and Cafe along Gen Ordonez Ave., Marikina Heights, Marikina City. Our first purchase is half a dozen cupcakes in assorted flavors. This included 2 Red Velvet Cupcakes, Chocolate, Cookies and Cream, Mint Chocolate Cupcake, and Rainbow Cupcake. What I noticed immediately is the generous amount of icing or topping. The height of the icing is almost as tall as the cupcake itself. Some may find this cloying but the kids love it. The chocolate slices on top of the red velvet, chocolate, and cookies and cream cupcakes were added treats for the kids. There were some cupcakes that we really enjoyed and some that didn’t make a good impression. The chocolate cupcakes were moist and dense making it a tasty and filling snack. The Red Velvet Cupcake looked a bit dry but it was moist enough for me to enjoy. I usually like the combination of mint and chocolate, but I wasn’t able to finish the mint and chocolate icing in the cupcake. Since we were satisfied with our first purchase, we decided to try their cakes too. Our cake selection included: Chocolate Cake, White Chocolate Macadamia Cheesecake, Carrot Cake, and Strawberry Shortcake. My mom loved the Chocolate Cake with its rich dark chocolate flavour and yummy caramel filling. We all enjoyed the Carrot Cake because it was moist and riddled with nuts and raisins. Just make sure you eat it immediately because the cake becomes a bit dry overnight. If you want something light then their chiffon cakes are also great. My ultimate favourite is the Chocolate Macadamia Cheesecake. I love the combination of creamy cheesecake and grainy crust, topped with crunchy macadamia nuts, caramel drizzle, and sweet white chocolate. It’s a medley of flavors and texture that make a big hit for me. We will definitely be coming back for more of this dessert from Capriserrie. 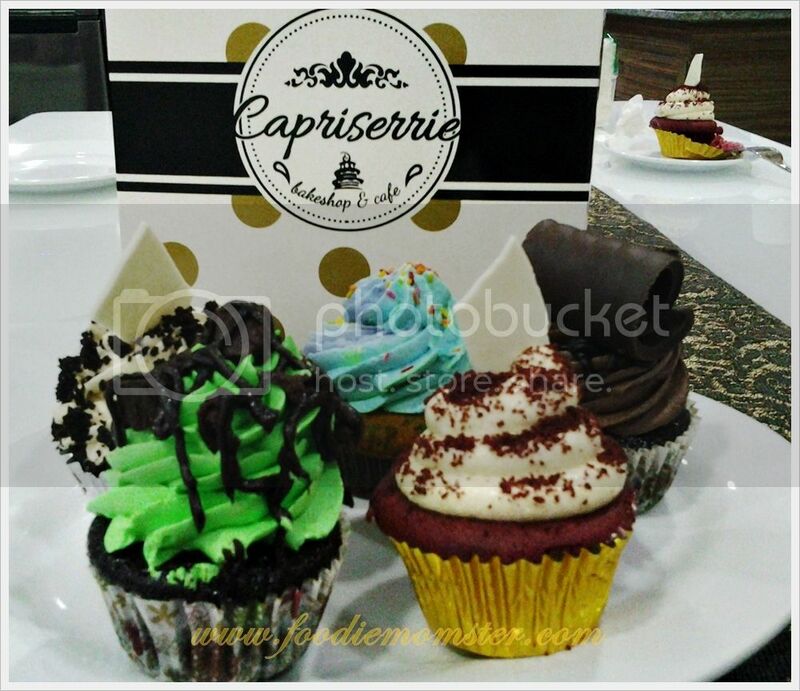 Cakes from Capriserrie Bakeshop and Cafe are a notch or two higher than those from commercial bakeshops. The generous serving of sweet icing and topping in their cupcake is a hit for kids. If you are the type who goes for the corner slices of the cake then you’ll love them too. Those who prefer moderate amount of icing may want to steer away from the cupcakes and just stick with their cakes. The Chocolate Macadamia Cheesecake is definitely worth a try.